Spending one-on-one time with each of your kids is crucial to a healthy parent/child relationship. Find out how we make that happen even in a house FULL of kids! Clean, cook, teach, run errands, rinse and repeat. That’s what my life often looks like! But, in the midst of all the chaos, I still need to find a simple way to spend one-on-one time with each of my kids. About 12 years ago I found the answer to juggling quality time with each precious child. But it wasn’t my idea! I just tweaked someone else’s a bit! A mother of five crazy-happy children impacted me in a way I’ll never forget. She was a SAHM and home-schooled her five children. She also did the yard-work and housework. She was busy — to say the least. I had one 15 month old and another baby on the way. I could not fathom how that mom got everything done! She then explained to me that she has a special day assigned to each of her kids per week. Oooh…sounds like a super-mom thing to do. Do tell me more, I quietly thought…so she did! Why did she spend one-on-one time with each child? She found it was difficult to invest one-on-one time with her kids, and so she simply scheduled it in! Making a time slot for each child kept her dedicated and committed to invest personal time with them. It was obvious the kids highly anticipated their special day every single week! The kids were loving, engaged, social and always seemed like a happy bunch! Many times you would see this mom out and about, and you would be sure to see a smiling kid or two alongside her. Even though she had her hands full, she made sure that each child had special time with mom. After seeing her success with this simple plan, I decided to jump on board! There have been times where we’ve skipped a day or changed things up a bit, but this is the basic schedule and plan we follow. It’s worked for several years and have helped my kiddos and I develop a strong parent/child bond. Each kid is special, so each kid should get that one-on-one time with mom or dad — don’t you think? 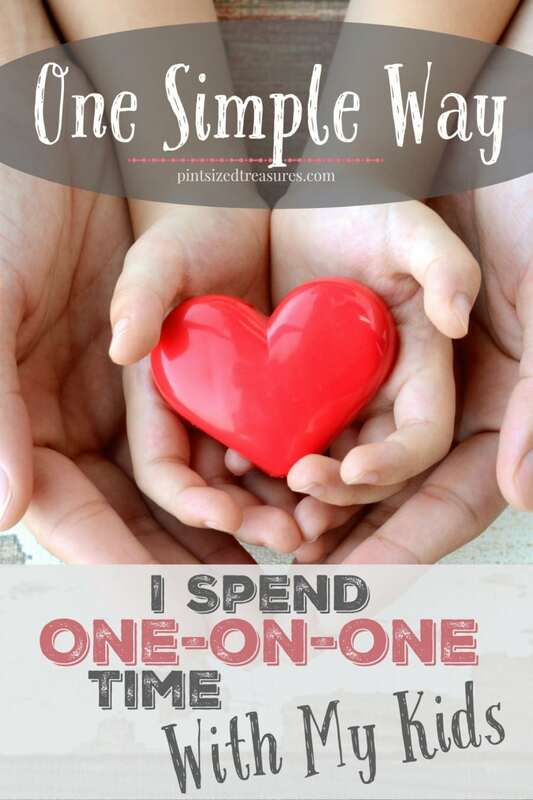 Check out my simple, yet fun plan that my kids have come to love! Assign each kid one night per week. If you have more than seven kids, you may have to double up or do twice a month instead of every week. Extend the bedtime! On the child’s assigned night, he or she is allowed to stay up an extra 30 minutes past bedtime. That time is especially reserved for mom and child. This special time can be spent cuddling, reading, talking, snacking or watching a short movie. 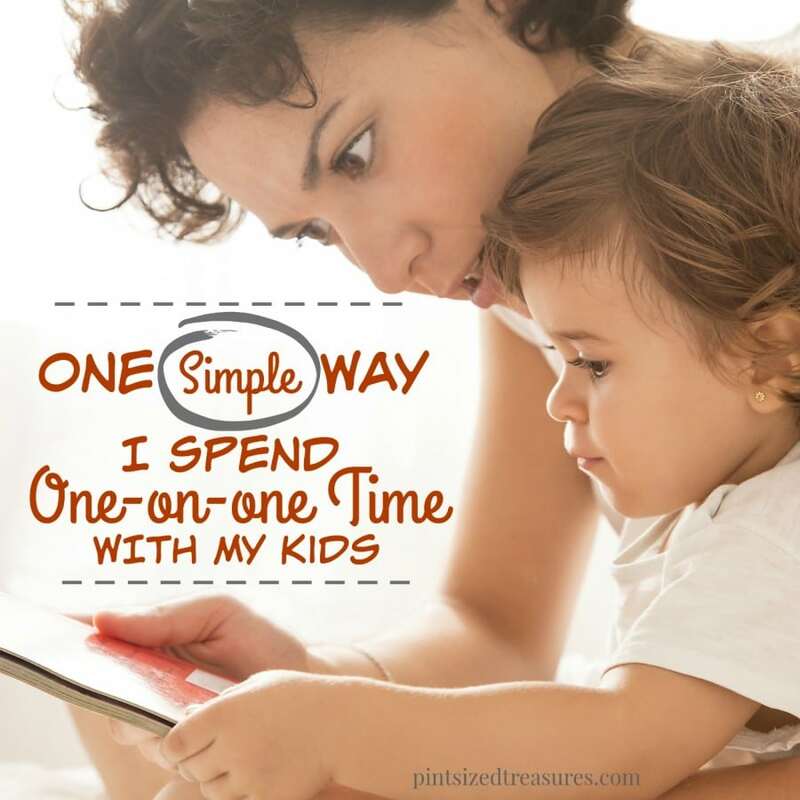 Any activity that you and your children enjoy connecting over is perfect for this mommy/child time. Each family is different and you know what fun activities keep your family glued together! Plan a fun meal! On that child’s night, let your child help you plan dinner. Do they love pizza, spaghetti or hamburgers? Incorporate their favorites into the meal and let them help you prepare the meal. They can also choose to set the table in a special way or fun theme. This gives extra chatting and teaching time for the two of you! If budget allows, I also like to surprise the kiddo with a small toy or treat on their assigned day. It doesn’t happen every week! The kiddos have learned that if surprises fit in mom’s budget and schedule — they will come! No one is disappointed if the surprises don’t come, only delightfully surprised if they do! I am so glad I heard about this plan when I only had two kids. I made a note of it, and tucked it away in my heart. I didn’t start using this plan until I had six kids, and only started with the oldest four children. It really works and gives the kids something simple and special to look forward to every week. Have you found a way to connect one-on-one with each of your kids? I would love to hear about it and I am sure other moms would too! Share it with us on social media!